Particularly on the West Coast, urban wineries are the emerging trend. The East Coast is following suit. There are a number of urban wineries in the Baltimore area and there are a few scattered about the state of Virginia. One of them is in Danville. Offset from one of the city’s shopping districts in a reclaimed warehouse space, you will find 2 Witches Winery and Brewing Company. The old loading dock now contains seating and tables. Inside there is a large area for seating and a bar for wine (and beer) tastings. The space behind the bar is filled with all the equipment necessary for brewing malt beverages and fermenting grapes. There was a small crowd in the tasting room, but everyone seemed to be drinking beer. Not to be deterred, I sidled up to the tasting bar where I met owner Ethan Brown. He and his wife Julie opened 2 Witches in 2015 and their operation became the only one in the state that houses both a brewery and winery under the same roof. According to Brown the winemaking operation probably qualifies for a “nano” status. Current annual production is just over 30 cases and maximum production is probably twice that number. Brown’s in-laws manage three acres of vines on their property in Callands, Virginia, where they began planting in 2009. So only Virginia fruit is used. I did not taste the Rosemont wines, but did sample both of the 2 Witches wines. Despite Brown’s modesty regarding his learning curve, I found both wines to be very approachable. The Cab Sauv is unoaked and relies entirely on the grapes. It had a nice nose and a lot of fruit on the palate. The Traminette displayed all of the typical, aromatic attributes. It too was a very nice wine. 2 Witches Winery is really the only game in this part of the state. As Brown’s winemaking skills mature and additional varietals are added to the lineup, the tasting program will only become more exciting. I encourage you to support this effort. When you stop in, I am very interested in hearing your thoughts. In northern Pittsylvania County, on a ridge not far from the town of Alta Vista, you can see the Blue Ridge Mountains on the distant horizon. It’s a rural area, where farms dot the landscape. You’re more likely to see tobacco than grape vines. Altillo Vineyards sits on that ridge above the Staunton River where it is the lone winery, in a region where wineries are spread very far apart. It’s an hour to the next nearest tasting room. Amid this area that lacks a strong wine culture, the father-son team of Robert and Eric Schenkel are casting about, looking for a business model that will work for their winery. In 2001 they started planting their first vines and incrementally increased the acreage over the next few years. The idea was to sell grapes and they were successful for a time, but the recession caused a market contraction. Even after the recovery, it was hard to make a go of it. So they decided to make their own wine. Eric had done some winemaking for personal consumption and he engaged Michael Shaps as a consultant. This should have been a winning combination. Eric produced his first vintage in 2009, but the region did not support his dry-style wines and a lone winery can’t generate regional wine tourism. Back to the drawing board. In its next incarnation, Altillo began to market their wines to other wineries. You can still stop in the tasting room and try the wines, but the effort has gone into selling the wines under labels other than Altillo. Most of the wine is sent north to the myriad of new wineries that are opening and either don’t have winemaking facilities, don’t have grapes or both. It seems silly that a winery would open without these two basic elements, but it’s happening. So there’s a niche and this may save Altillo, but what about the wine? I didn’t taste all of the offerings, but I tried enough wine to get a sense of Eric’s skill as a winemaker. The Chardonnay was done in neutral oak. It had a great mouth feel and was filled with coconut and other tropical notes. This one took silver at the Governor’s Cup, missing gold by only a point. It’s an amazing wine. Eric makes a very good example of a Virginia Cabernet Franc, but I want to say a few words about a couple other wines. Altillo produces a Shiraz, which is basically a style of Syrah, but I’ve only seen this at one other winery. It had a smoky nose, nice fruit, big mouth feel and a fabulous finish. It’s a real standout. My top pick, however, was the Meritage (Bordeaux blend). It had a licorice nose, a lot of complexity and that big mouth feel that’s a feature of all the Altillo wines. Oh and the finish! I just went on and on. Brilliant wine! Contrary to what I just pointed out, I visited on one of the rare occasions that Altilla had a crowd in the tasting room. I was assured, that this really is the exception. A group of birthday revelers had gathered to celebrate with a tasting and a few glasses of wine. I was warned that I might be forever tainted by their infamy, if I mentioned them in my blog. Nevertheless, this stalwart band was actively supporting Virginia wine and they are deserve our applause. I’m including their picture, so that we might celebrate each of them. When I arrived, Eric was behind the tasting bar pouring for the group. I watched him in action as he expertly explained each of the wines and entertained questions from all members of the party. There is a clear effort to educate the local public, but this may be something of an uphill battle. Based on the quality of the wine and beauty of the location, I urge you to give this winery a look. It’s only a few miles from Interestate 81 and completely worth a short detour. If you can squeeze in a visit, let me know what you think. I must admit that I have not tasted the American Way wines, but I have stopped by the property. This winery produces exclusively fruit wine. Based on the berry vines on the edge of the property, it appears that some or all of that wine is made from estate fruit. The property appears to be dedicated to farming and the facilities or outbuilding (where I assume the wine is made) are quite rustic. This is not a reason to avoid American Way Country Wine, but it is meant to set expectations. If you happen to stop in, I will be very interested in your reaction and opinion. Apr 21-Dec 31; Wed-Sat 11 to 6, Sun 1 to 6; Or by Appt. The primary economic engine of Halifax County is agriculture. It is an area that was once primarily tobacco, but that crop has largely been replaced and the old tobacco barns that line the back roads have become weathered and overgrown. Viticulture might take hold, but today there are only two wineries in the county. One of these is Bright Meadows Farm. Grapes were first planted at Bright Meadows in 2002 and a tasting room opened two years later. Today there are ten acres under vine. The primarily native and hybrid varietals being grown include: Concord, Steuben, Niagara, Catawba, Norton and Chambourcin. Many of these grapes are represented in very small numbers in the state of Virginia. European varietals have greater name recognition and, in many cases, are considered to make superior wine. This is largely a misconception. Owners Shirley and Boyd Archer have enjoyed some success and have attracted a loyal following. During my recent visit, I was able to sit down with Shirley. We spent about an hour sampling the Bright Meadow offerings and talking about the winery. 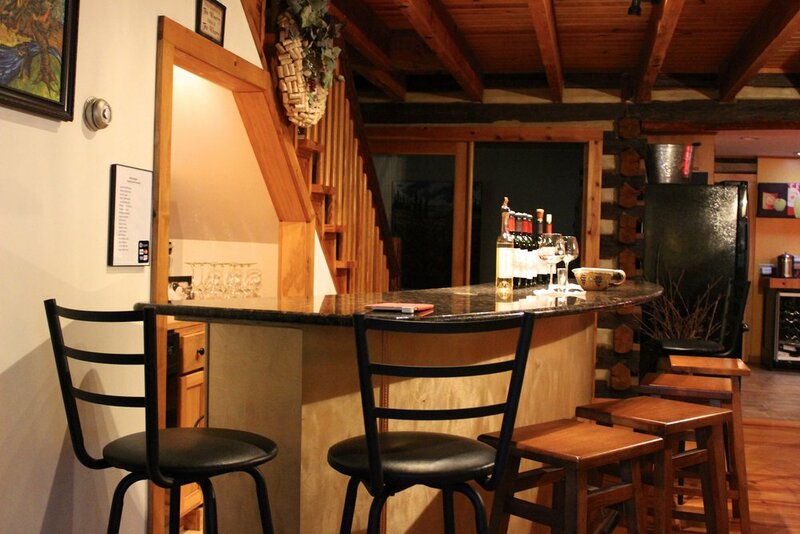 It is a modest operation with a small but comfortable tasting room. There are plans to add on to the existing structure, which will increase the tasting and event space. In the mean time, the public area is adequate for the steady flow of small groups that cycle through the tasting room. The wines, as I mentioned earlier, are made primarily from native and hybrid grapes. All of the offerings I sampled were strictly dry-style and displayed more complexity than I expected. The Concord, in particular, was a complete surprise. It did not exhibit the typical grape jelly notes. In fact, contained enough acidity to make it a potential food wine. Of the half dozen wines I sampled, the Burley Red was the standout. This single-varietal Chambourcin lacked the astringency that often ruins similar wines. This must be, at least in part, due to good vineyard management. In any case, the wine was big and complex with a lot of fruit on the palate. It is a perfect example of what can be done with Chambourcin. I should also mention the blackberry wine produced from locally sourced berries. Bright Meadow makes it without added syrup and lets the fruit speak for itself. It was one of the best berry wines I have ever tasted. Like the other offerings, it was dry style. It tasted entirely of fresh, ripe blackberries. Bright Meadows is a small but serious enterprise. The Archers are farmers and are, therefore, well versed in the agricultural end of winemaking. They have also cracked the part of the code that takes place in the winery. Wines bearing the Bright Meadows label are solid and very reasonably priced. Short of finding them at a wine festival, there is little choice but to make the drive. So if you are in the area, I recommend a short detour with a stop at the tasting room. After you do, please let me know what you think. pr 11-Dec 13 Fri-Sat 11 to 5; All other times by appt. I was down in a very rural part of Halifax County on my first visit to the Southern Virginia Wine Region. Unlike Central and Northern Virginia, there are no real clusters of wineries in this part of the state, so driving time became a factor. I’d only visited two tasting rooms and it was nearing the end of the day. I’d been very happy with my discoveries. 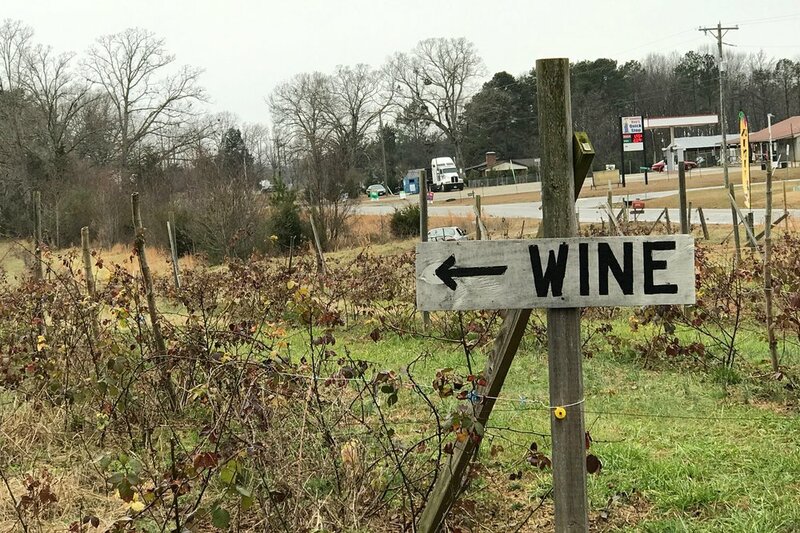 Southern Virginia has a reputation for sweet wines and, so far, I’d found no proof of that. I pulled into Hunting Creek Vineyards, knowing that it would be my last stop of the day. What were the chances that I’d uncover another great winery. Three in a row seemed like a long shot. 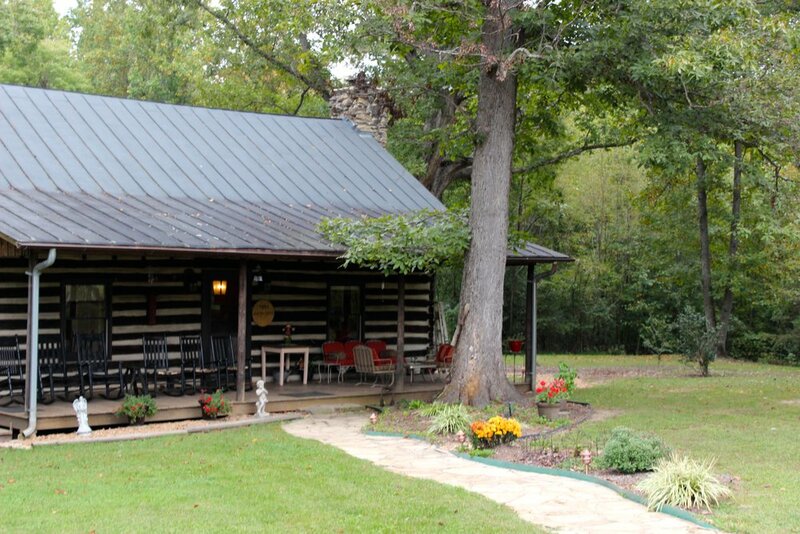 The tasting room is a small log cabin set back next to the trees. The lawn is manicured, there are flowers along the walk and a line of wooden rockers sit on the porch. As you enter the front door, you’ll notice the interior is a tasteful mix of rustic and modern. The curved, polished-wood tasting bar and modern settees are juxtaposed against the exposed beam ceiling and old fieldstone fireplace. It’s the kind of place I could imagine spending a long weekend. So far, so good, but what about the wine? Seven wines were being poured. The first was a single, bone-dry white. The Viognier is done in French oak, but didn’t really display strong oaky notes. It showed big hints of stone fruit, nice acidity and a bright, crisp finish. Then we moved on to the reds, which were really the main event. The lineup included a complex Bordeaux blend filled with dark fruit, a Shiraz-style Petit Verdot fermented with Viognier skins and five percent Viognier added for good measure. I’d hit pay dirt once again and I haven’t even told you about the star of the tasting. Now, I’m not typically a Merlot drinker. But Kowabunga! We did a vertical tasting of three Merlots. The 2011 was respectable for a bad year. I’ll talk more about the 2010 in just a second. The yet-to-be-released 2012 needs a little more time, but it was full of chocolate/mocha notes and a great offering that portends great things to come at Hunting Creek. Now the Hunting Creek 2010 Merlot was just out of the park. This big, dark wine spent eleven months in French oak. It was full-bodied and almost jammy with an absolutely beautiful nose. It was complex and many more adjectives. This was the day’s most exciting find in a day full of exciting finds. It certainly ranks among the best Virginia Merlots I’ve had the good fortune to taste. For a guy that doesn’t drink much Merlot, I took some home. Milt and Sandy McPherson bought the Hunting Creek property in the early 1990s. Milt was still practicing medicine, but he had a strong interest in wine and his science and chemistry background translated well into winemaking. So in 2002, Milt and Sandy began planting grapes. Today there are three acres under vine and Hunting Creek is very much a small-batch, boutique winery. Current production is between 800 and 1000 cases annually, which can easily be sold out of the tasting room. Milt took me down to the winery. Of course all the standard equipment is there. Basically, if you’ve seen one winery, you’ve seen them all. The differences typically amount to scale. In this case, however, there are plans for the winery. A section is being renovated to accommodate special tastings and possibly wine dinners. This may be the extent of the public events, but that’ s probably enough. The emphasis here is on the wine and that shouldn’t be sidetracked by large, public events. Small though they may be, this is a potential powerhouse winery. Quality far exceeded my expectations. Unfortunately, you’ll have to journey down to Southern Virginia to sample the wine. On the other hand, even if it’s a little remote, this is a lovely venue that is really worth a visit. It’s a young winery that deserves our support, so I do recommend making the drive. After you’ve made the trip, let me know what you think. There are a couple Southern Virginia wineries that are nothing less than world class producers. One of them is certainly Rosemont of Virginia and I am embarrassed that it took me so long to pay them a visit. The historic farm has belonged to the Rose family since 1858, but the property was originally settled in the 1700s. During the Civil War, the farm was occupied at different times by both Union and Confederate forces. The family started planting grapes in 2003 and today there are 29 acres under vine. The first Rosemont wines were bottled in 2007 and the tasting room opened the following year. Winemaker Justin Rose graduated from University of Virginia with a degree in chemical engineering. He left Virginia briefly to study at Napa Valley College and work for a time at O’Shaughnessay Winery, before returning to work at Rosemont. Justin obviously learned his craft well, because his wines are of extraordinary quality. Only estate fruit is used to produce the 5000 to 6000 cases that are bottled annually. There are about 16 different wines, which includes a Port-style wine made from blueberries and a sparkler that saw its first release in 2018. I tasted through only a small number of these during my visit and I had tasted several previously. It is fairly evident that all of the Rosemont wines are worthy of note. There are three in particular that I should mention. The single-varietal Cabernet Franc is a fabulous wine with notes of ripe berry mingling with the a hint of spice and black pepper. The 1858 red blend, which is a club release, is complex with nice fruit and a long finish. My absolute favorite Rosemont wine, however, is the Kilravock blend. With its black fruit, fig and licorice notes backed up by firm tannins, it is a perennial award winner. On the map it seems like Rosemont Vineyards is a bit off the grid, but the tasting room draws traffic from seasonal tourism drawn to the area by the John H. Kerr Reservoir. It is also not too far from Interstate 85. In any case, the tasting room is quite beautiful, the staff is friendly and the wines are just off the charts. So make an effort to stop in and discover this great producer for yourself. After you do, please let me know what you think. 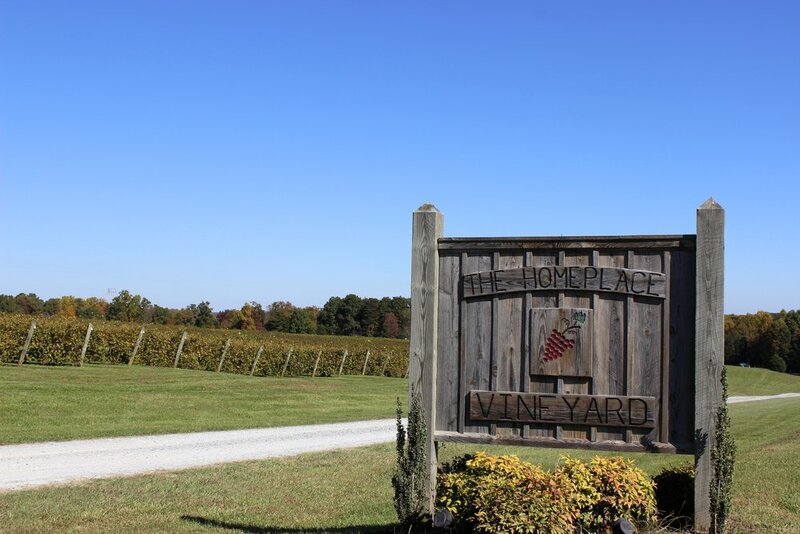 The Homeplace Vineyard is located on a 100 acre farm, in the hills of Pittsylvania County in Southern Virginia. This has been a family farm since 1912 and was originally devoted entirely to tobacco, until it was transitioned to grapes in 2004. For about five years the fruit harvested from the nine acres of vines was sold to other wineries. Today, the grapes are used exclusively for production of estate wines. Driving through the gate and onto the property, you’ll see grapevines lining the road on the left side and corn fields stretching out on the right. In the distance is the tasting room constructed entirely from timber recovered from two old tobacco barns. The screened-in wrap-around porch and dark wood gives it a very rustic, cabin-like feel. The interior continues this theme and just feels homey and relaxing. When I arrived, Mary Smith was working behind the tasting bar. Mary is one of the co-owners. In addition to being extremely knowledgable, I found her to be very engaging and enthusiastic about the wine. She filled in details about the winery and history of the property. It was a first-rate, informative and educational experience, which explains why The Homeplace is such a popular local venue. Chris Smith is the winemaker at The Homeplace. He received his formal education at Patrick Henry Community College in nearby Martinsville. Additional guidance came from winery consultant Joclyn Kuzelka. She is originally from the Czech Republic, but made wine in Australia and New Zealand and currently works as winemaker at Virginia’s Stanburn Vineyards. 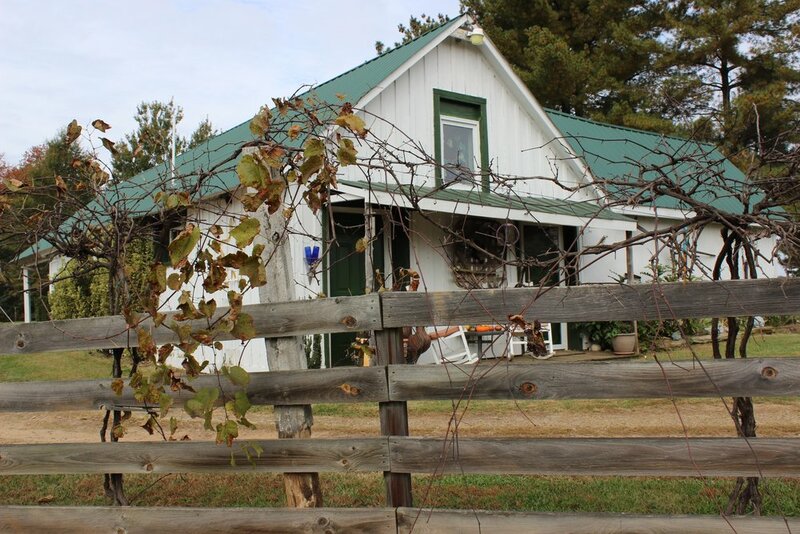 Good, quality, balanced wines are the hallmark of The Homeplace offerings. The local audience tends more toward sweet wines, so the offerings are skewed in that direction, but among the eleven wines I tasted, there is a definite range from dry to sweet. Right out the gate, there was a dry-style Viognier. This wine is done in both oak and stainless steel, but there was distinct oak on the nose. It had a great mouth feel, with pineapple notes and crisp acidity in the finish. The Homeplace Chambourcin was another winner. This deep-red wine, with its bright cherry notes took Bronze at the Governor’s Cup. A final wine of note is the ShamRaz, which is a Chambourcin/raspberry blend. It has a distinct grape signature, but it’s filled with big raspberry notes. This one was off the charts when paired with chocolate. The Homeplace wines can be found primarily in the tasting room or at one of the twenty-two festivals they attend each year. Weddings and other private events can be scheduled and conducted on the property and there are a number of public events each year. The winery is very much a part of the local community and enjoys support from that base. So if you find yourself in the vicinity of Chatham, Virginia, or if you’re just inclined to make the drive, this winery is worth a visit. Put this one on your list and, if you should happen to drop in, let me know what you think. Sat 11 to 4 and by appt. It’s often the case that winemaking for personal consumption is the “gateway drug” that leads to commercial production. This was true for Corky Medaglia. He will tell you that, due to his Italian heritage, winemaking is in his genes. Whatever the case, following his retirement from the Navy and time working in Northern Virginia, Corky was ready to be his own boss. In 1995, he and his wife Nancy purchased property in Southwestern Virginia with an eye toward operating a winery. Tomahawk Mill was in operation for 100 years, before it was retired. In 1988 some of the acreage was devoted to vines, so when the Medaglias bought he property, they were purchasing a functioning winery. Owning a historic mill, however, is a project of its own. After the Medaglias became full-time residents in 2000, there were a number of large maintenance issues to address. There is regular and labor-intensive maintenance on the dam and the entire millpond had to be drained and dredged. The interior of the building is maintained as a kind of museum, but it appears that many more projects exist. Fortunately, the winemaking part of the equation seems to running more smoothly. The tasting room is inside the mill, but the winemaking operation is housed inside a couple of old grain silos. The four acres of vines will yield twelve tons of fruit in a good year. This results in about 2000 cases of annually. Tomahawk Mill makes sixteen different wines and Corky was mixing up a carboy of mead when I visited. The offerings are primarily dry-style, but a couple have a little residual sugar, so there is something for nearly every palate. The wines include many of the usual Virginia offerings, but there was a nice Riesling with a floral nose, big mouth feel and nice citrus notes. Tomahawk Mill offers a couple well-crafted fruit wines. There is also a Retsina-style wine with just the slightest hint of pine, a pair of Concords and a very nice Virginia Pinot Noir. The other typical Virginia varietals included Chambourcin, Cabernet Sauvignon and Cabernet Franc. It was an interesting lineup. Pouring the wine was a retired marine, who goes by the nickname “Gunny.” He volunteers his time to help Corky with all aspects of the operation. Gunny was involved in the big maintenance projects, but he also helps make wine and mans the tasting room as needed. I found him to be very knowledgable about the Tomahawk Mill wines, the history of the property and the details of the winemaking operation. Gunny clearly likes what he’s doing and represented the winery quite well. It was a great tasting experience. If the wine and historic mill are not enough to convince you to visit, Tomahawk Mill also holds a number of public events throughout the year. The summer and fall festivals are the largest, but numerous smaller happenings dot the calendar. In celebration of Halloween, a Poe reading was scheduled for the evening of the day I visited. So check the calendar and see what works for you, but do try to stop in and support this Virginia winery. If you make it out there, I’ll be very curious to hear what think.